The blogosphere has been a buzz lately over the black and white trend. Honestly, I forgot about it as I was putting this outfit together. This was worn to a bachelorette party with the theme 'little black dress'. but boy was it cold that day! Anyhow, I guess this makes me accidentally trendy? I am all about bright pastels and neons this spring. Avert your eyes lest you be blinded on the blog in upcoming weeks. PS: Did you notice the black hair tie I forgot was on my wrist? Whoops! Linking up to Thrifters Anonymous - I scored this dress for less than $10! WHAT!!! You thrifted this dress? 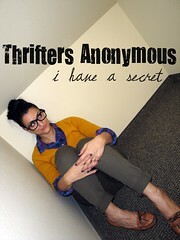 I'm running to the thrift store as soon as I finish stalking your blog to see what great finds I can come across today!